Is UkNationalLottery a Scam or Legit? Read Reviews! 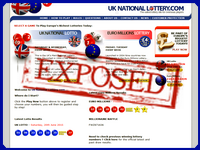 Uknationallottery Exposed — Non-UK Residents Only! Uknationallottery.com is play by the KISS rule – Keep It Simple Silly (being polite). It’s an online lottery provider for two lotteries, UK National Lottery and EuroMillions. But don’t look to play here if you are a resident of the UK. They will not accept your order. UK residents are redirected to the official online lottery site national-lottery.co.uk for UK lotteries. So why do people play here? Playing at Uknationallottery.com is very straightforward. Players can either type in their chosen ticket numbers for UK National Lottery or Euro Millions or click on ‘Lucky Dip’. There are no syndicates available. Lottery tickets cost £4 for both games though they will offer a discount for one year subscriptions. Tickets are purchased on behalf of the players with a scanned copy emailed. The original tickets are kept in a fireproof safe (love that one). They say players can claim their prize the day after you win. I wondered about this one as I’m sure it could take longer if the prize is one of those mega jackpots. Winnings can be claimed either by transferring to the debit or credit card used, UK bank account or bank draft. Oh – or you can pick it up yourself and they will help with visa requirements (well, they offer). Uknationallottery.com takes 10% commission on all winnings unless the money is retained in your account to play more lottery games. Then, no commission is deducted from your winnings. Bank/transfer fees are also taken off the top depending on how your winnings are paid. Oh, and make sure you are 16 years of age or older or you won’t be able to collect your winnings. This online lottery provider is owned by St. Peters Marina Ltd. established by a group of people to help friends in Australia and South Africa to play UK lotteries. They are based in Newcastle with a snail mail address, UK phone number and email address. Customer service is available 9:00 am through 5:30 pm Monday to Saturday. They do respond very quickly and with clear answers. According to the rules and regulations of lotteries in the UK, players have to be a resident of the United Kingdom or Isle of Man. But, online lottery providers act as the person on the ground who is actually buying the ticket on your behalf. Personally, I think this is a bit of a gray area at the same time there are enough companies doing it that is seems to be accepted practice. Would you mind rating UkNationalLottery.com? This is a cute little site which does seem very clean and straight forward. The team had a few issues with the commission applied at the same time, uknationallottery.com does do all the work in getting your winnings. Hilarious that we have to give this a thumbs up for non-UK residents and a thumbs down for UK residents. I also think that most people would like to play additional lotteries – I mean only two and that doesn’t include Thunderball. Interesting! The commission is fair given they go get my winnings. I’m not a resident of the UK so that works. Limited as there are only two lotteries but they are the ones I want to play. I’ll have to do a comparison with others. Thanks Lotto Exposed.